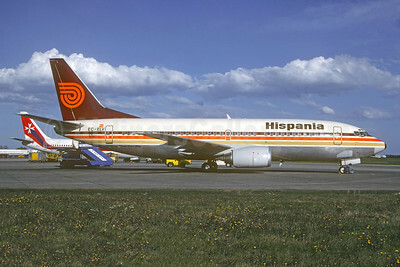 (XF/HSL) (Palma de Mallorca) 1983 - 1989. Photos. Framable Color Prints and Posters. Digital Sharp Images. Aviation Gifts. Slide Shows. 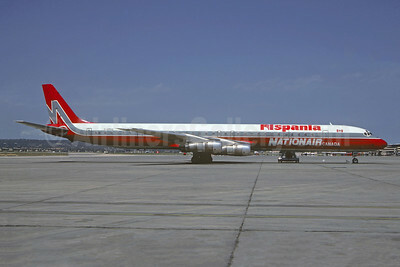 Hispania Líneas Aéreas - Nationair Canada McDonnell Douglas DC-8-61 C-GMXQ (msn 45982) (Nationair colors) PMI (Christian Volpati Collection). Image: 946173. Hispania Líneas Aéreas Boeing 737-3T5 EC-ELV (EC-213) (msn 23064) (Orion colors) MUC (Christian Volpati Collection). mImage: 946174. 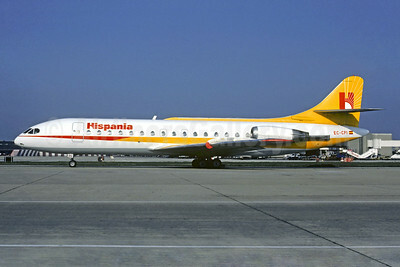 Hispania Líneas Aéreas Sud Aviation SE.210 Caravelle 10R EC-CPI (msn 236) LGW (Christian Volpati Collection). Image: 946175.